I've been working on Markdown Monster which is a 64 bit application. I found out the hard way today that when you fire up the debugger in Visual Studio it will launch in 32 bit mode by default even if the application would run 64 bit when run directly. In the process I discovered quite a few things of the debugger I wasn't aware of along with a few suggestions from Kirill Osenkov that were illuminating and that I'll share here. 32 Bit Debugger for 64 Bit Process? Before we get into this I want to clarify that in most cases it's probably OK to be debugging in 32 bit mode when running what otherwise is a 64 bit application. One of the beauties of a runtime environment like .NET is that it for the most part doesn't have to care what CPU platform you're running under. The framework masks most of those differences for us. If you don't think that's cool, you probably haven't done low level C/C++ style programming before and don't know how much of a pain dealing with bitness can be! That it's so easy in .NET is actually big deal. 32 bit/64 bit issues usually come up in relation to OS features and locations that are different. I ran into the 32 bit issue while debugging some start up configuration check logic in Markdown Monster. MM requires a few file and system registry settings in order to work properly - specifically IE 10/11 browser emulation and an optional path check - in order to work properly. The application checks whether certain values have been set and if not attempts to set them. As you probably know, system folders and registry paths can vary depending on whether you are running 32 bit or 64 bit. Folders in particular can be different. So one thing MM does is add the Markdown Monster install path to User's path so that you can type mm Readme.md or mm data.json or mm web.config (MM supports editing a few common text formats besides Markdown) to view the document in the editor. And it does at runtime when running the EXE directly from explorer or the command line. which clearly is a 32 bit path on a 64 bit system. Both are the same Any Cpu Visual Studio target as the runtime application, but very different results. 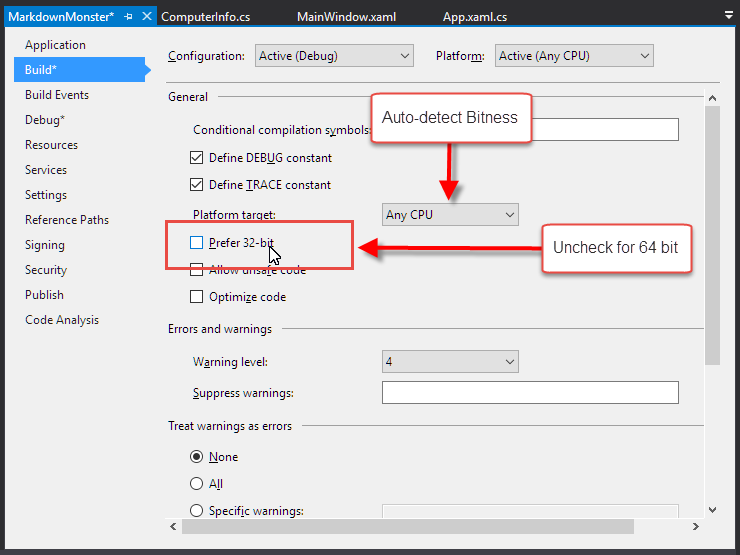 The key setting that affects the debugger behavior is the Prefer 32 bit flag which should be disabled if you want to run in 64 bit mode using Any CPU. If you're running the 'raw' debugger against your process that's all that needs to happen to ensure your app runs as you'd expect it to run from Explorer or the command window. Note that neither of these settings are debugger related - they affect whatever build mode (Release/Debug) that you apply it to at runtime, no matter what. This EXE is a small stub loader that actually loads your main assembly (in the EXE) into the default AppDomain of the host and then calls the [Main] function on it. For the most part the behavior between native and hosted are the same but there are a few differences. One of them is that the host process will default and stick to 32 bit even if the Prefer 32 bit option is not checked. The only way I could get the host process to work in 64 bit is to explicitly change my project build target to x64 instead of Any CPU which is silly. 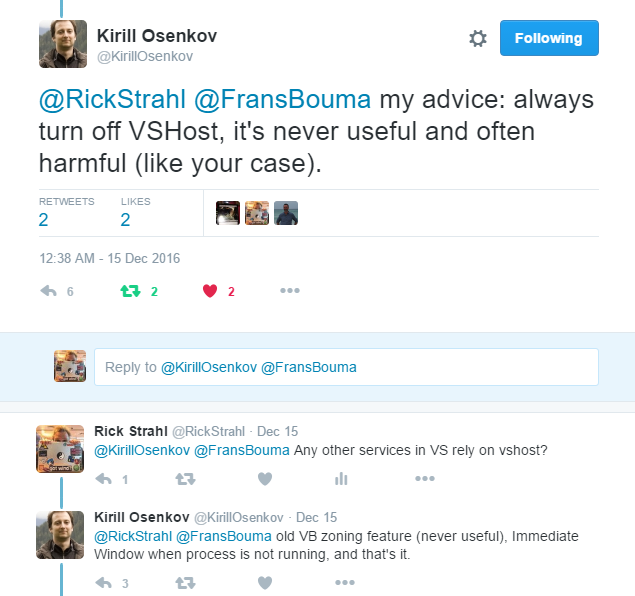 As Kirill mentions, the host container is a throw back to older Visual Studio days, and there's actually very little functionality it provides to the debugging process, so you are better off not using it at all unless you need the specific features it provides. 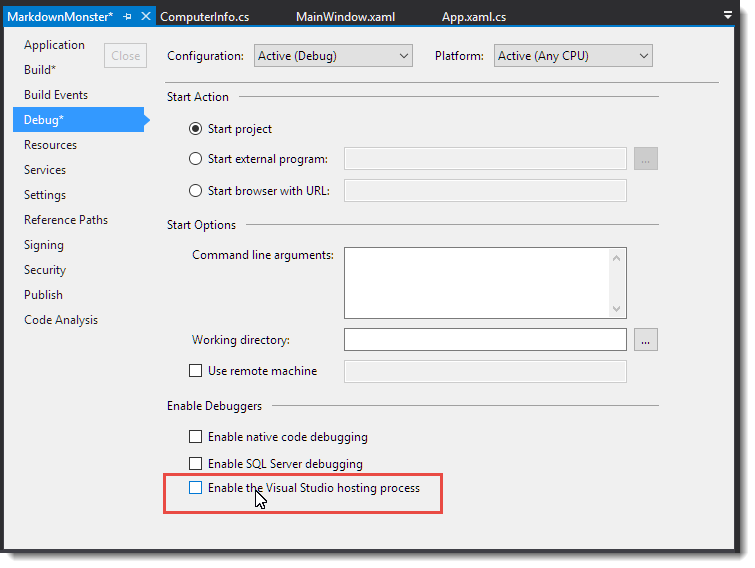 To turn it off use the Debug tab on the Project Settings and uncheck Enable the Visual Studio hosting process. FWIW I'm glad I found out about the non-need for the VSHost process as that's caused me all sorts of grief with locked assemblies in the past. I gladly bypass this extra step. 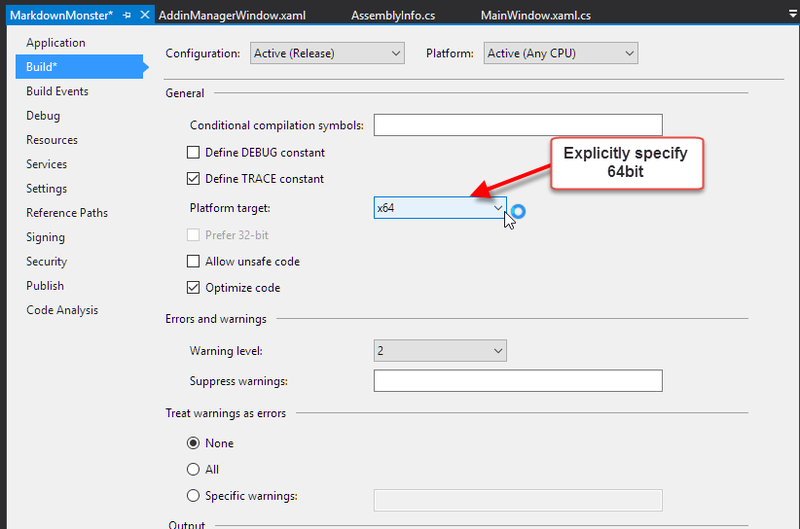 Now with both Prefer 32 bit and Enable the Visual Studio hosting process off, debugging works as expected in 64 bit mode. In most cases the differences between 32 bit and 64 bit are not important in your applications, but regardless I think it's a good idea to ensure that you are debugging in the same environment you're expecting to run the application in. It's easy to overlook some odd behavior that only occurs due to the OS differences. My case of checking for the Program Files is just one example of that. It took me a while to figure out why the application was not updating the path the way I was expecting to. Especially if you are dealing with the file system and special folder paths, or the registry be very sure that you're getting data to and from the right places. One of them is that the host process will default and stick to 32 bit even if the Prefer 32 bit option is checked. One of them is that the host process will default and stick to 32 bit even if the Prefer 32 bit option is not checked. Absolutely right Ralf. Fixed. Thank you.